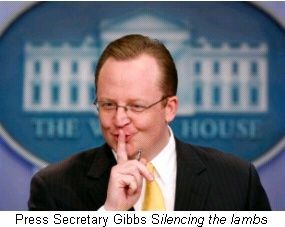 White House Press Secretary, Robert "the mole" Gibbs, was outed last night for his lead role in throwing the 2010 congressional election to the Republican Party. The White House refused to return calls to comment on the charge or verify the outline of the carefully orchestrated plot. But a variety of off the record sources spoke as one - the plot is real and has been going on long before the 2008 general election. The scope of the plot goes well beyond the upcoming congressional contests. In a recent interview for The Hill newspaper, Gibbs used an entirely new technique in election tactics - offend and humiliate a key element of your voting block right before a critical election. Gibbs ridiculed progressives as part of the "Professional Left" and said, “They will be satisfied when we have Canadian health care and we’ve eliminated the Pentagon. That’s not reality.” Research indicates that this approach has never been used within 90 days of a general election. But the story goes much deeper than simple electoral politics. The planned outburst has a short term benefit for Republicans but, as we will see, Gibbs is reporting to a higher authority. Daily Kos Yesterday: "Yes I'm Angry...angry at the Democratic leadership -- and yes, even some of our fellow “progressives”..."
...Angry at a two-party system that favors corporations over people; angry at a justice system that most severely punishes those who are least able to fight back; angry at the media who refuses to call a lie a lie; angry at a health care system that allows private corporations to profit by allowing the sick to suffer and die; angry at the terrorists who want to deprive women of our reproductive autonomy; angry at the misogynists who want us to know our place; angry at the Democratic leadership -- and yes, even some of our fellow “progressives” -- for treating women's rights as a fringe issue; angry at anyone who feels the need to question whether it’s really necessary to be so angry. This is another loud shout in a growing and louder trend of unhappiness and, dare I say -- distrust -- with the inability of Democrats to get it together. Progressives: We want a public option! Progressives: But you can use reconciliation like Bush did so often, and then you only need 50 votes. Filbuster reform advocates/Obama loyalists: Hey progressives, don't be stupid! Be pragmatic. It's not realistic or Serious to use reconciliation to pass health care reform. None of this their fault. It's the fault of the filibuster. The White House wishes so badly that it could pass all these great progressive bills, but they're powerless, and they just can't get 60 votes to do it. because you only need 50 votes, and you've said all year you have that! No. We don't have 50 votes for that (look at Jay Rockefeller). our industry-approved bill instead . . . on a strict party line vote. Just a very serious and pragmatic view of reality. We get it and we aren't gonna just roll over on it. Dems better deal with their problems now or they will pay the price in the voting booth. Because we do get it. That's what we find ourselves caught in here in America during its greatest internal crisis since the Civil War. The wealthiest 1% has got America by its balls. And to keep us from realizing it to the point we might have to be labeled "Enemy Combatants" they've been treating us to the old Good Cop, Bad Cop routine that they're used to using on America's minorities and the weakest elsewhere. Treat this as an Open Thread. Think Progress has provided an in depth study of Lieberman's betrayal of progressives. The information will not come as a shock to anyone on the left that has followed him closely and recognized this unholy alliance early on as Lieberman pledged his allegiance to the warmongering neoconservative whack jobs and their likudnik/AIPAC allies. Lieberman's story is a bizarre combination of apologist for their neoconservative failures and an accomplice in covering up their crimes. For those of you that are unfamiliar with Lieberman's self-propelled decent to this hellish low, please adjust your internal thermostat in order to keep your cool as you read because, in reality, this is not simply a chronicle of the betrayal of progressives, and the left in general, but of Joseph I. Lieberman's betrayal of America and some of the most basic principles she was founded upon. I received this communication because I subscribe to their action newsletter, "Our Future Today." The conference will be assessing Obama's first hundred days. Seems interesting to me and it made me think what a good idea to call a conference of progressives to discuss the hundred days, where we stand and where we want to go. It would also be a wonderful chance for a bunch of us to get together. Read more about "America's Future Now"
These are demonstrated by providing Health Care for all. Dean stresses the urgent need for us to express these values, on an emotional level, and not just in Policy Statements. "People vote on their Values -- NOT on Position Papers!" Read more about What are Progressive Values? The Progressive Context: What Obama Can't Do for the Progressive Movement. In my review, Taking Back America in the books section of the Journal, I discussed a conference on the subject of political framing and propaganda sponsored by George Soros and featuring an article by George Lakoff as well as a discussion of George Orwell's seminal work. (Lot's of George's!) Anyway, it seems like the Rockbridge Foundation has just disbanded. Read more about The Progressive Context: What Obama Can't Do for the Progressive Movement. The results of actual studies just like this one are quite consistent and robust, and they may surprise you. Participants given “140 years” as their initial comparison point think that Gandhi lived much longer than those who were given “9 years” instead. Findings like these demonstrate what psychologists call the “anchoring effect”: our strong tendency to make judgments that are biased toward arbitrary standards of comparison. The plausibility of these comparison “anchors” makes no difference to us--we rely on them regardless. As another example, research subjects asked whether Einstein’s first visit to the United States occurred before or after 1992 give a much more recent estimate of when he arrived than those asked whether he visited before or after the year 1215. This anchoring effect might be merely a perplexing curiosity--if not for its potentially profound consequences in the real world. Consider John McCain’s recent remarks that he’d be fine with American troops in Iraq for the next 100 years, or longer. Whether he’ll be able to implement the early steps of this troubling vision will depend on many things, including who’s sworn in as the next President of the United States in January 2009. But the “100 years” anchor can--on its own--shift the public’s expectations and comfort level for how long it’s reasonable to have troops in Iraq. Several additional years suddenly seems like a brief stay when compared to a century or more. ePluribus Media Book Reviews editor, Carol White, brings us a review of What Orwell Didn’t Know: Propaganda and the New Face of American Politics -- edited by András Szántó, with an introduction by Orville Schell. This is an important book considering the political and social future facing every American in the wake of the Bush presidency. Learning the lessons from the failure to defeat Bush in the 2004 election — a campaign that he supported with large donations—he focuses this time on exposing how totalitarian propaganda methods are gaining a foothold in our ostensibly open society. Read the entire review on the ePluribus Media Journal and then come back here to discuss.